But we all know you're here for the pitches, amirite? Onwards! Saige: A personal chef for everyone. | This isn't the first time co-founder and CEO Pat Pow-anpongkul has been on The Consumer Show stage — last July, his company was called Real Meal Delivery, and they were a "delivery-only restaurant." Since then, they've done some amazing things ($600K in annual revenue, 100 percent word-of-mouth), but they still had some problems, like high churn and a lack of stickiness. Now, they're moving on to a philosophy of virality plus retention being 10 times better, and have pivoted to becoming Saige, the modern-day personal chef. When they started looking into the issues they faced with Real Meal, the team found they fell in between two habitual use cases: Meal planning and on demand. That meant they had to change consumer habits to get people to think about Real Meal in between, at 4 p.m. every day, and we all know changing consumer habits is an uphill battle. They also experienced friction asking people to order off a menu multiple times per week for dinner, since that's not typical consumer behavior either. What did they do really well? Coming up with key consumer insights is really messy data. They had to go out and ask folks, who said the idea was fantastic and they loved it, yet were not ordering. People said, "Well, we forget about you, you don't come up top-of-mind when we're preparing for dinner." They could have said it was a marketing problem, but that's not the case — they dug deep into core consumer insights, in the realm of consumers thinking about food, and have a grander vision. What can the community help with? Try them out! They started over in May and that can be scary, so help them get back on track. Use their promo code (SWITCHYARDS gets you 50% off the first week), give them feedback! To solve these issues, they moved to a personal chef model, and rebranded as Saige. As opposed to a personal chef in your actual kitchen, preparing expensive meals, Saige has meals cooked in a commissary and delivered to your door, ready to heat in minutes. The move has been well-received so far; weekly retention has improved more than 250 percent, while their Net Promoter Score has gone up to a 63. Under the previous model, only 28 percent returned for a second meal. Now, 80 percent order a second time. They're using the power of operational expertise and machine learning to design and deliver more than 400 meals per day, Mondays and Wednesdays. With the new approach, Saige feels they are a better alternative than competitors because they remove the need for cognitive processes to go into dinner; a family of four ordering for multiple tastes, dietary restrictions, and preferences can now easily find the right meal that matches everyone. Saige's machine learning and processes "learn" and improve as people use it over and over, intuiting meals they'd like, and the end goal is the consumer doing nothing and having "perfect" meals show up at their door. ParkENT Cycles: We provide an electronic bicycle rack that locks up your bicycle. | If you're looking for an entrepreneur who's serious about the product or service, who's willing to tackle all the challenges and work out of a garage, then Thad Oviatt is your guy. I've written about Thad and his bike locking idea extensively on my blog in the past, so I won't get into it here again, but suffice it to say that he has the street cred when you talk about an uphill battle with your startup idea. Thad says there just aren't any good options for safely locking up your bike anywhere. Every 30 seconds, a bike lock is cut and a bike costing $400-$20,000 is stolen. Only one percent of bikes are ever found and returned! What did they do really well? Well, they developed a thing, and that's pretty cool! They're good at locking your bike up, and they are good at producing a product. The last four to five years, they've spent $80k from friends and family all on patenting and iterations of prototypes. They also just got into Flashpoint accelerator! What can the community help with? Switchyards could start by upgrading the bike racks out front ... but seriously, if you have connections to places to put the bike racks, or interested in investing, reach out! Thad has a utility patent, and user testing has proven that it's so intuitive even small children can easily grasp the concept and explain it. Seventy-six percent of the users tested said they'd use an electronic bike rack, and most wanted to know where they were located in town. Up next for ParkENT is a deployment plan that includes universities, businesses (including condos or apartment complexes), hotels and stadiums, and parks and trails. If you have a connection to someone at, say, the Georgia Tech parking office, you should make an introduction! ParkENT has been bootstrapped all the way with only friends-and-family funding, but they're now looking for financial partnerships ($50k would build 10 bike units, for example). The $2 per hour charge is variable and can be set by the property owner, so it can match whatever the property needs. ParkENT Cycles was recently named a "Top 10 Internet of Things Companies Disrupting the Transportation Industry" by Disrupter Daily, and with the rise of biking commuters, I know that things are only going to grow from here! CharterUP: Get instant pricing for bus rentals. | You can tell the rent-an-entire-bus industry is ripe for disruption when you see the third pitch from a bus reservation company in as many weeks. We won't go into the competitors here, but CharterUP wants to be the online platform for bus reservations by collecting all the mom-and-pop companies and aggregating them into one seamless online platform. What did they do really well? Since this industry was all pen and paper before, there were no APIs to tap into, no way for companies to access data about availability or anything else. CharterUP has given these companies the opportunity to put a foot into the 20th century. What can the community help with? One way is to work for them — they are looking for people to get on their team to scale up as fast as possible! Customers come in to the site, put in trip details, get quotes instantly, and pay and book online. This is way better than the current antiquated process, which often takes hours or even days to get back a quote from companies who still use a pen and a carbon copy pad to do business, have a physical reservation calendar, and can only accept checks or cash. With CharterUP, customers can view images of the buses they're interested in, and see consumer reviews, safety information and even citations from the DOT. CharterUP is also working on a mobile app for bus tracking to see locations the day of the trip, instead of having to call the bus company. CharterUP says they have two customers: First, the bus companies themselves, who need a reservation platform and growth potential; and second, the consumers, who are renting a bus for a wedding, prom or other event and need to make an educated decision. They believe they differ from competitors by putting the decisions in the hands of customers, who can see all the information and make their choice of buses, versus others who make the reservations on behalf of the customers. CharterUP soft-launched last month with buses, but could charter many things, from limos to yachts to jets, since those industries are also antiquated in a similar fashion. Additionally, they're looking for new team members (including back-end and Android developers, sales and support agents), so if you're looking for a truly disrupting company to be a part of, reach out! Garnish & Gather: Bringing Atlanta's community of family farmers, food artisans & chefs into your kitchen. | Founder Emily Golub calls Garnish & Gather "Atlanta's local mealkit company and online grocery delivery store, dedicated to connecting eaters and consumers in Atlanta to the local food scene." Unlike many companies, they aren't focused on a quick-scale model: They don't ship the food, and they're sticking with the Atlanta area. Basically, G&G wants to create community through local food. Every week, they offer five new meals on the site, each featuring special ingredients from local farmers, which they deliver on Sunday and Monday. They operate in a unique niche because of the local, sustainable, customer-focused product, with a personal connection to the customers and the food each week. They're big on being environmentally friendly (hence, no shipping waste), and deliver the meals in reusable containers. It's a unique customer experience that allows customers to cook delicious dinners quickly, via an easy interface, with no commitment required. What did they do really well? They've built a strong sense of brand that customers can trust, and they've found new ways to surprise and delight customers and create an excellent experience customers love. What can the community help with? Try their meals, share and post about them, they are always looking for new customers! G&G was one of the first players in the meal kit scene years ago (though in the last 60 days, quite a few moves have happened with Blue Apron, Sunbasket, Whole Foods and Freshley), and they are doing well. Their customer retention is higher than the industry average, 83 percent of the money spent on food supports more than 50 local family farmers and makers, and their lifetime value is three times higher than the Blue Apron model. All of this via primarily word-of-mouth marketing and a presence at local farmers markets. Plus, local chefs like Kevin Gillespie with Gunshow are fans! G&G doesn't have an app at this time, but their Web site is mobile-friendly, and customers can easily browse the online menu there or on Facebook and Instagram, order online, and have the meals delivered to their homes or one of 35 pickup locations around town. They have both an on-demand and a subscription-based model, so customers can join as members or order just one time. Customers can also just shop for local, fresh groceries through the site, versus ordering entire meal kits, and can add a la carte items to meal kits at any time. As a devoted farmers market and buy-local shopper, I really like this idea, though the price point felt a little higher than I could budget in on a regular basis: Meals are priced for two ($28) or four ($54) people, and the a la carte groceries are of course an additional cost. An audience member did ask if they were considering an option to make pricing more accessible to families of all income levels, which Emily said could be down the road as they explore product mixes with different price structures. All in all, I could see myself doing this service now and again, if nothing else because it's fresh, local food that supports my community. Rush: Get the things you need, delivered in 10 minutes. | Y'all know that I am all about convenience and efficiency, and I do love delivery services. So I perked right up for Rush, an on-demand delivery startup that brings you snacks, drinks, whatever you'd find at a grocery store, in about 15 minutes, from noon to 4 a.m. Craving ice cream? Lost a cell phone charger? Rush is your go-to. Sadly (albeit understandably), they're currently focused on college campuses, so I can't get my late-night candy bar craving taken care of just yet. What did they do really well? Guerilla marketing. They will do anything to get people to know about them, like wear Rush shirts and sprint through the plaza so people would see them, or stand at the Georgia Tech rec center and hand out Powerade. They have sponsored Tech clubs and events, and even snuck into dorms and slid promo cards under doors. They've done well on a limited budget. What can the community help with? They're looking for suggestions on growth — hot food? Apparel? Reach out with ideas! They use a mobile warehouse (fancy word for a van right now) to stock the available items, which reduces delivery time, and focus on micro-delivery radiuses. (Parking near the Georgia Tech dorms is a popular location for the drivers to hang out, for example.) They're faster and more affordable than Zifty or Postmates, and charge only a $1.95 delivery fee. They can afford this because they can get out twice as many as the competitors in the same amount of time. The products are stored in the van warehouse, though sometimes delivery requires the driver go on foot (like during an ATL United game). With a limited (but popular) inventory, they keep overhead low and delivery times quick. Most clients order three to five items or more, and they're tracking return users to determine the best way to scale the business. Now if they'll only expand outside the Georgia Tech radius, because I'm craving a little Ben & Jerry's right about now! 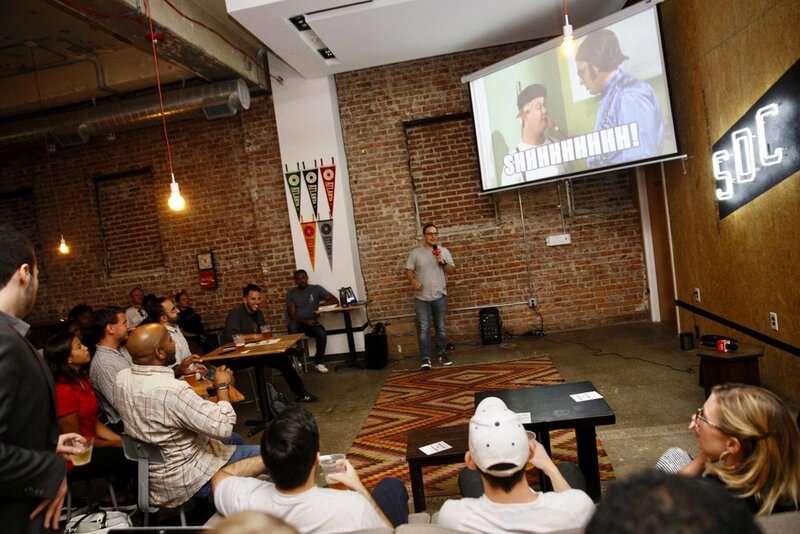 That's a wrap for the seventeenth Consumer Show at Switchyards; see you there next time?